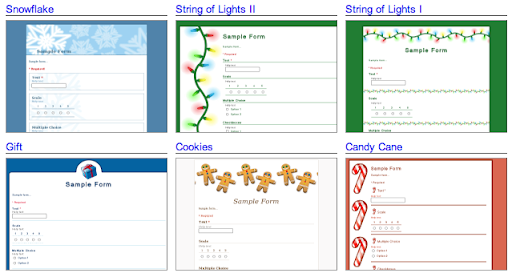 There are also a lot of great holiday templates available in the Google Docs template gallery. Templates include holiday shopping lists, holiday newsletters, party invitations, RSVP forms and much more. Not sure where to start? We'll be highlighting some of our favorite holiday templates over the next week, so stay tuned. The Google Docs team is celebrating the holiday season with holiday themes in Google forms and holiday templates in the Google Docs template gallery. Whether you are planning a recipe swap, family potluck, ski trip, a charity trip or need a party RSVP form, the new holiday themes in forms can make this season a little brighter. To try out the holiday themes, create a form and the click "Theme: theme name" to see all the themes that are available.